d. Windows Applications. Any Win 32 application (*.exe) can be embedded. The difference between this content and the documents is that the application will automatically be executed by PhotoViz. The CAC module in PhotoViz has a 30-day trial and a licence must be purchased at www.picsalive.com after the trial period. If users do not purchase a licence after the trial period, a free online encryptor is available in the Mail ++ portal (www.mailplusplus.com). Registration Photos are special images that must first be viewed before users can access content in subsequent images. 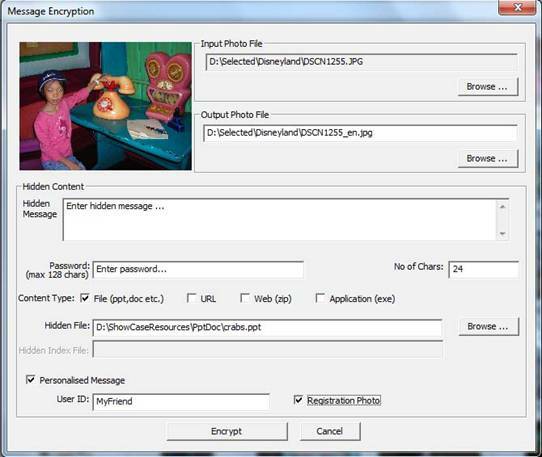 Photo Messages and Photo Contents can be personalized so that only selected recipients will be able to access the messages or contents encrypted in the image. Personalization of Photo Messages and Contents creates a “personal” community or a social network structure where members can exchange photos, share feelings, notes securely. Figure 5.1 shows an overview of the registration and personalization process. If a user wants to create a secure community with a selected audience, the user must first send a Registration Photo to all members in the group. When members of the group view the Registration Photo in PhotoViz, they are automatically registered and will be able to read all future Photo Messages or Contents from that member i.e. one-time registration. 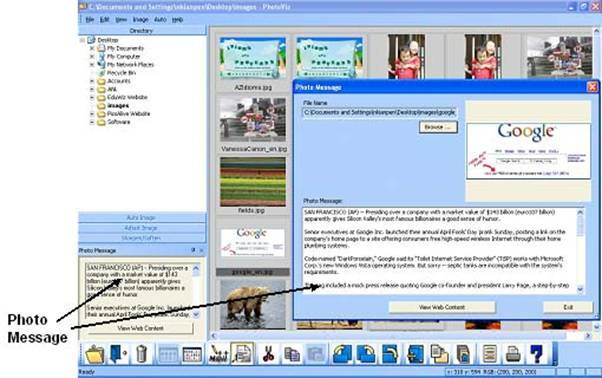 If Photo Messages or Contents are not personalized, all users of PhotoViz will be able to access and read the contents. 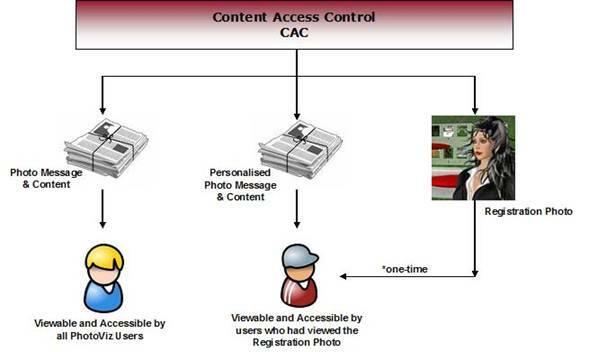 Users can embed message, content, create Registration Photo and password-protect their data in the CAC module. There are two ways to access Photo Messages and Photo Contents in PhotoViz. The first method is to select the image in Display Area. 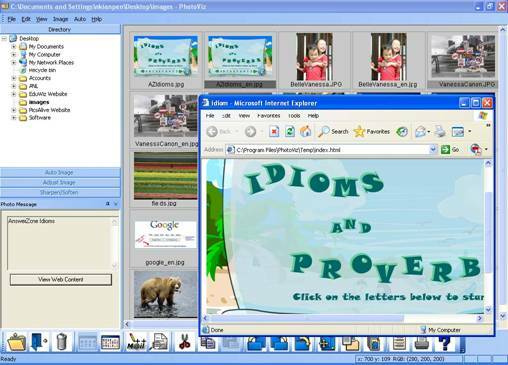 The Photo Message, if available, is displayed on the dialog box located on the bottom of the left hand side of the user interface (see Figure 5.3). Another way to access Photo Messages is to click on the quick access icon . A separate dialog box showing the photo as well as the Photo Message is displayed as shown in Figure 5.3. 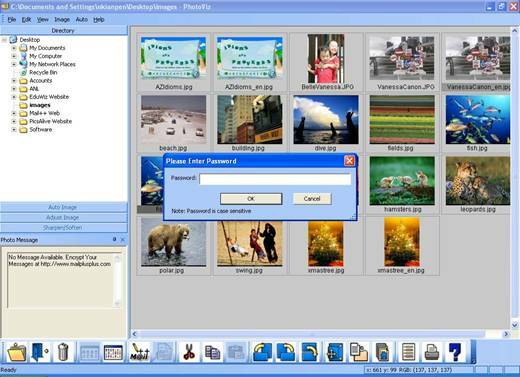 Photo Contents are currently classified into three categories: Web contents, File Attachment and Windows Applications. PhotoViz automatically detects the type of Photo Contents and the appropriate button is displayed. Figure 5.4 shows an Adobe Flash contents being embedded into a photo. The web contents are launched upon the clicking of the “View Web Contents” button. If the contents are password protected, a dialog box to enter the password is displayed as shown in Figure 5.5. This is an added security feature to prevent unauthorized access to the contents encrypted in the images. The maximum length of the password is 128 characters. Images from the iPhone app - Active Photo can be emailed or through direct transfer between the iPhone and computer via a WiFi connection. To access embedded media and data, select the image in PhotoViz and click on the quick access icon . A dialog box display the media embedded by the iPhone is shown in Figure 5.6. Figure 5.6 shows the message, audio recording, location data and the device parameters. There are two types of audio recordings: compressed (*.caf file format) and uncompressed (*.aif file format). By default, PhotoViz uses the Windows Media Player for uncompressed audio. 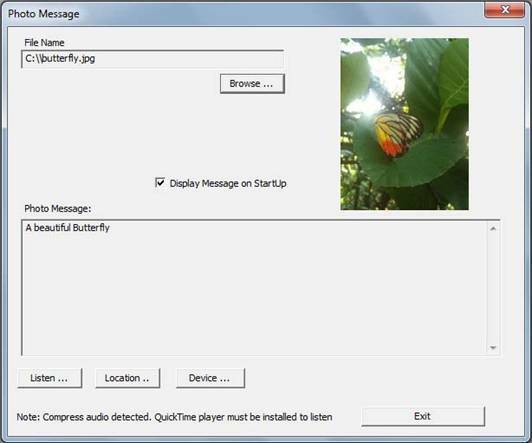 To listen to compressed audio recordings, a QuickTime player is needed. When the “Location …” button is clicked, an Internet Explorer browser showing the location where is the image is taken will be launched. The location is displayed using Google Maps. The phone’s parameters are shown when the “Device …” button is clicked (Figure 5.7). 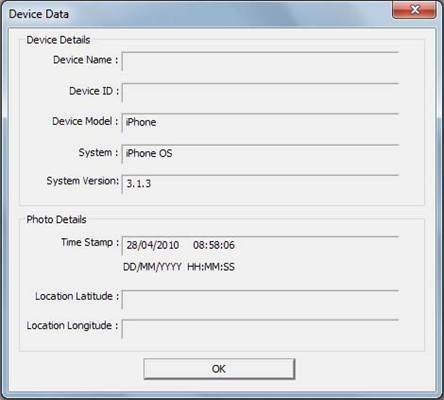 As seen in Figure 5.7, phone details such as name, identification number, model, system, system version are recorded. The time stamp as well as the location data are also shown. These parameters enable users to verify the authenticity of the image.